Now you can replicate a bit of the Glen Brook magic right in your own kitchen with Robyn’s Recipes. Our fabulous camp Nurse and Assistant Summer Camp Director, Katy Gibney—known as Nurse Katy, even in the off-season!—shares her experience with a common camp concern in A Glen Brook Guide to Homesickness. 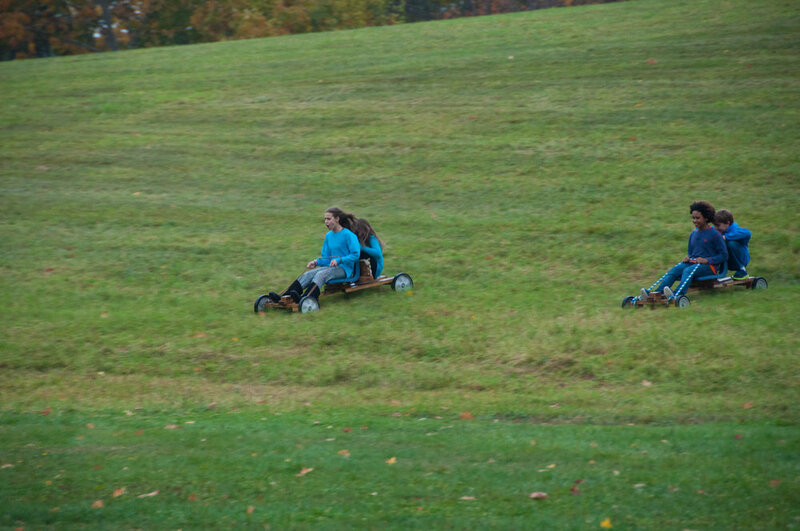 We had a combined class trip with the Brooklyn Waldorf School's 4th and 5th grades this week. We spent a lot of time exploring the still icy forest and enjoying the sunny fields. Being immersed in the natural world provided countless opportunities for learning, especially with such a curious group of students! We also appreciated their hard work on the farm, their great cheer, and their thoughtful gratitude before meals. We look forward to seeing many of these students back for summer camp or a future class trip! We piloted our first Adult Weekend at Glen Brook in response to requests for a chance to retreat to a beautiful natural place, rest, be creative, enjoy good food and great company—and perhaps some treasured alone-time, too! On March 20th we celebrated International Earth day, on the Spring Equinox. The founder of the day John McConnell, a Colorado man, dedicated it to “Drawing together peoples of all nations, cultures, and religions to advance Peace, Justice, and Earth Care.” So what does the Earth have to do with world peace? It seems there is a direct connection being made between the earth and humanity, as if implying that ones harmony requires the others. 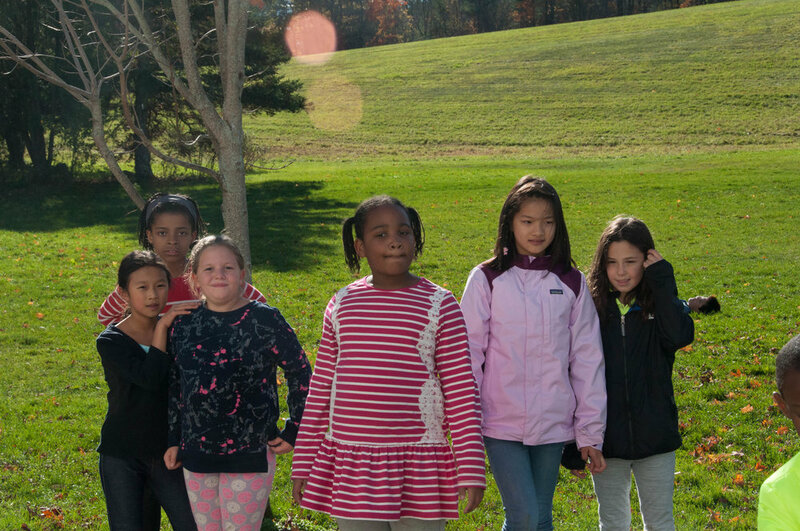 Camp Glen Brooks mission has a similar sentiment: “At the core of all our activities is a belief in the inherent need in the human spirit to connect with one another and the natural world through work and play”. So though it may often seem like the modern world is pulling us away from it, we ARE part of the natural world. Our disconnection from the other parts of it can have devastating results on both it and us. With spring coming in we are already gearing up towards summer. Spring cleaning, greenhouse planting, taking care of the grounds…all of these things take place in the spring but with the scent of summer in our noses. Summer is a time when the Glen Brook community is in full swing and we mend our relationship with the earth and each other. We do this through daily stewardship of the land and constant mindfulness and intentionality towards our footprint on our world. 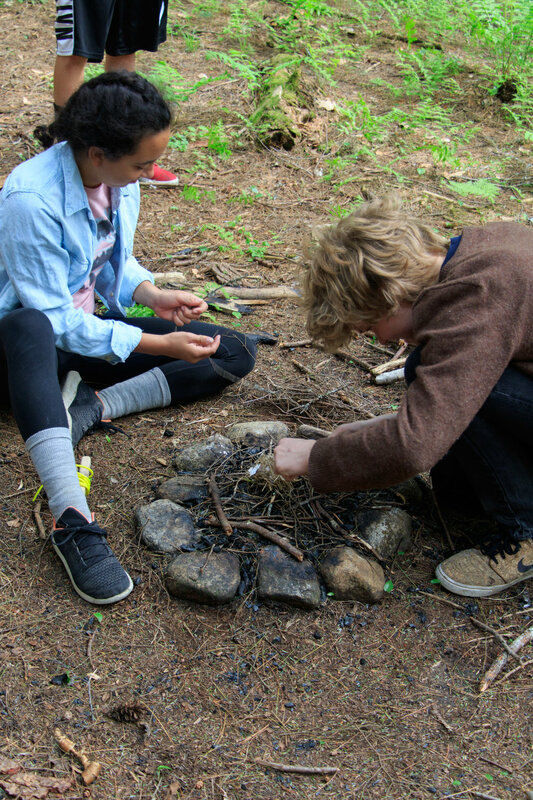 Staff and campers alike spend real time being outdoors and having a connection to the soil through gardening, hiking, canoeing, camping and many other daily activities. When we come together every night to sing together, we are not just a group of people together. We are strengthening a bond with the ground below us and the stars above. In those small moments, instead of thinking about our relationship to the earth, it simply feels like we are a part of it. Continuing the tradition that Daphne Braden began in 2006, we at Glen Brook are fortunate to have several Bates College students here as counselors for our Winter Camp. Bates has the same winter week break as Winter Camp, and this connection has brought us two of our current year-round staff: Mark Stehlik and Jake Lewis! My name is Kylie! I’m a counselor at Glen Brook’s 2019 Winter Camp, returning after a wonderful six weeks of counseling during Summer Camp of 2018. This year I come back with a great appreciation for the Monadnock regional landscape, and for camp culture. The Glen Brook community creates feelings of peace, reflection, and communal love. Its values teach the significance of togetherness, play, and hard work. I know that each time I come back I am greeted by people whose sense of the world and sense of self is built entirely on love — love for our holistic community, made of the earth and all its inhabitants. This year I am a senior at Bates College. I am graduating with a degree in English and certification to teach English at the public secondary level. I am driven strongly by my passion for education as it feeds much of my world view. I believe in teaching that finds power in human differences, that does not discriminate based on race, age, socioeconomic background, sexuality, or gender identity, and that is confident in the inherent potential of every human being. I come to Camp Glen Brook because its ways echo my approach to education and humanity generally. During a single day at Glen Brook, one sees children playing with the uninhibited, authentic energy of youth, staff members who are kind to their campers and their coworkers, and people of all ages and backgrounds working hard to keep tidy and sustain their living environments (both inside and outside). Stargazing under a rising moon. The rhythm of winter camp is quite similar to that of summer camp. We begin the day with camp-wide farm-to-table breakfast. A group of campers sets the tables and serves the food, and another tends to cleaning chores when the meal finishes. (Lunch and dinner are the same.) The day continues with various activities that may be calm or lively. Much of it is spent outside. We may sled, ice skate, walk in the woods, or ski. If campers have inside time, they may play board games, play cards, create art, read, or engage in any other form of quiet. The day concludes with all adults and children participating in evening singing and an evening activity. Regardless of where campers are or who they are with, they find harmony and camaraderie in their environment. I love each morning, afternoon, and night because of the various opportunities for human connection, calm, and free-spirited play. In a society that continually relies on technology, it is often hard to feel centered. Another reason I treasure Glen Brook is because it offers solace from the stress of screens. Campers, counselors, and administrative staff alike do not use devices while engaging in daily activity. Clocks hardly exist at Glen Brook. Campers rely on the schedule, administered by their counselors, to pass the day. This results in authentic interaction and the incredible liberation of truly being in the moment. In sum, I return to Glen Brook because I believe in its values and its practice. I love the landscape and the people. This year, I bring with me three other Bates students to enjoy the splendor. They remark often about the uniqueness of this place and the privilege it is to come here. Of course, Glen Brook welcomes them with the love it offers everyone. I am so thankful! ...Just inappropriate clothing. This old New England saying shifts our thinking here at Glen Brook. We do not allow our minds to erect a barrier between us and nature by believing that the weather is too bad to be outside. What freedom and joy this mind-shift creates for us and our campers and students. Decades ago, most of us would have lived on farms, like Glen Brook’s small diversified farm. We would have had to go outside everyday, no matter what the weather to care for our animals. Stepping out the door to breathe the fresh morning air, feel the breeze and humidity, and take in the light of dawn, would have awakened our senses and given us a sense of anticipation for the day to come. While most of us no longer carry the responsibility of a home farm, campers and students that come to Glen Brook greet the day with chores on our small farm—whether the weather be cold, or whether the weather be hot. There may be a groan or two getting out of bed to a rainy day, but the students' smiles around the breakfast table after an early start in the elements remind us here that it's worth it to weather the weather, whatever the weather. We still have some room for your family to join us for our February 8 - 10 Winter Family Weekend and Winter Camp (for grades 3 - 8) February 18 - 23. We recommend packing for all possible weather, but we keep a store of hand-me-down boots, raincoats, hats and gloves, just in case. We hope to see you at Glen Brook soon! Yesterday as the sun was setting there was a quiet excitement in Glen Brook’s barnyard as a stock trailer arrived with our newest farm family members, three beautiful Hereford heifer calves. They were raised on a loving farm in Bedford, New Hampshire by farmer, Steve Blais. We were lucky to get these beautiful girls. Steve would likely not have sold them, but it was a challenging haying year and his food supply for his herd is dwindling early…three fewer mouths to feed, even little ones, makes a difference. When these newcomers entered the Glen Brook barnyard, territory of four other young cows, we were prepared for a bit of shoving. But all the young ones intermingled as though they had know each other their whole lives. We should not have been surprised, Glen Brook is always welcoming to strangers! We look forward to introducing you to our growing herd next time you come to Glen Brook. Session 2 has begun! We have an amazing group of campers, and everybody has jumped right into camp life. Eating, singing, playing, learning, and living together in this little slice of paradise. The Lynx left for their wilderness trip on Monday, and will return on Thursday-- we apologize for their absence in the photos! Today the camp is on an all-camp hike up Gap Mountain, a shorter hike due to the inclement weather forecasted for this afternoon. The campers and staff haven't hesitated to soak up and enjoy every bit of Camp life, rain or shine. We're looking forward to Thursday's contra dancing and Friday's "Glen Brook Games" day. Stay tuned for more photos of these events! This week our all-camp hike day went up Mount Monadnock, the biggest all-camp hike that we do. We look at Monadnock every day from Camp, so it's always a big achievement to get to the top and look back towards Camp, where somebody flashes a signal mirror. We were impressed with everybody's perseverance and good attitudes on this challenging hike! Despite the difficulties, hike days are always such a joyous time where people spend the day together with nothing to do but chat, share stories, and sing together as we walk along. Even a big challenge becomes manageable with good company! We celebrate Independence Day every year, and at Camp we focus on the ideals of life, liberty, and the pursuit of happiness. Not personal happiness, per se, but happiness at large. 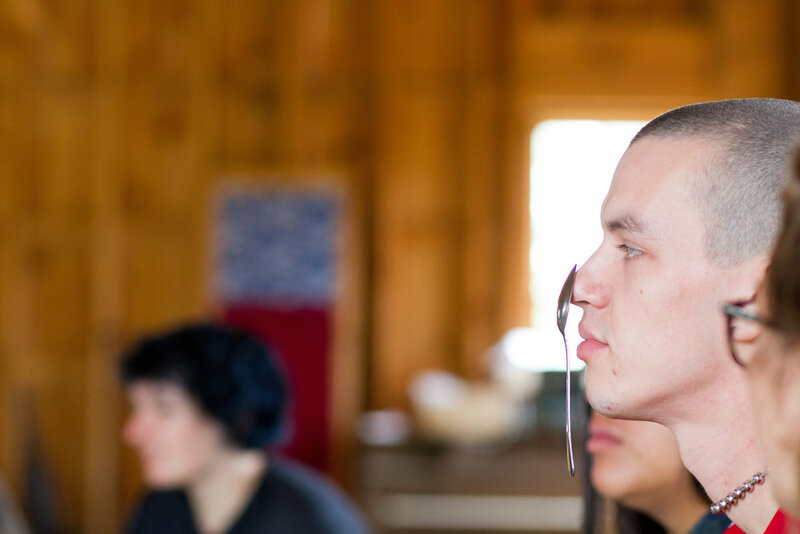 The easiest way to pursue happiness is to work on the skills like compassion, creativity, and supportive cooperative living-- all essentials at Camp! We spend the day going on a hike, swimming in the pond, playing relay games, going on a scavenger hunt, and finishing the day with an amazing picnic dinner, bonfire with singing and a story, and fireworks. Enjoy photos of some of the fun from the day, as well as our recent all-camp hike, and some other time at the lake! It's hard to believe one week of Camp has already gone by! With every day full of fun, friends, and new activities, time sure flies. We celebrated the 4th of July on Saturday (Glen Brook time...photos to follow! ), which was a full day of fun. Photos here include some of our nightly evening activities, contra dancing, Saturday Night Entertainment (which happened on Sunday...again, Glen Brook time! ), games, art, swimming, and our bonfire. You can find these photos here. The Lynx started off the session with a wilderness trip to the beautiful White Mountains of New Hampshire. Trips are always an amazing bonding experience for camper groups: they leave many modern comforts behind in order to experience the beautiful natural world, and share together in the challenges inherent in cooking, cleaning, carrying, and traveling that happens on a trip. The Lynx trip this year was no exception. On return, campers who have been coming for many years declared it their favorite trip of all time, and the group has been happy and eager to dive back into camp life. You can see some photos from their trip here. Stay tuned for more updates soon, including photos from the 4th of July celebration! Summer Camp has gotten off to an amazing start! This amazing community of campers, counselors, and CIT's has been kind, enthusiastic, and energetic as we dive into all the wonders of Camp life. It's hard to overstate the wonder of living at Camp Glen Brook in the summer time-- in many ways unchanged since the the first summer in 1946. When it's hot we swim in the pond more and spend more time in the woods where it's cooler. Three times a day we come together to share in our absolutely phenomenal farm to table food, most of which is grown and raised right here at Camp. Every evening, the entire camp comes together to sing songs and play games. 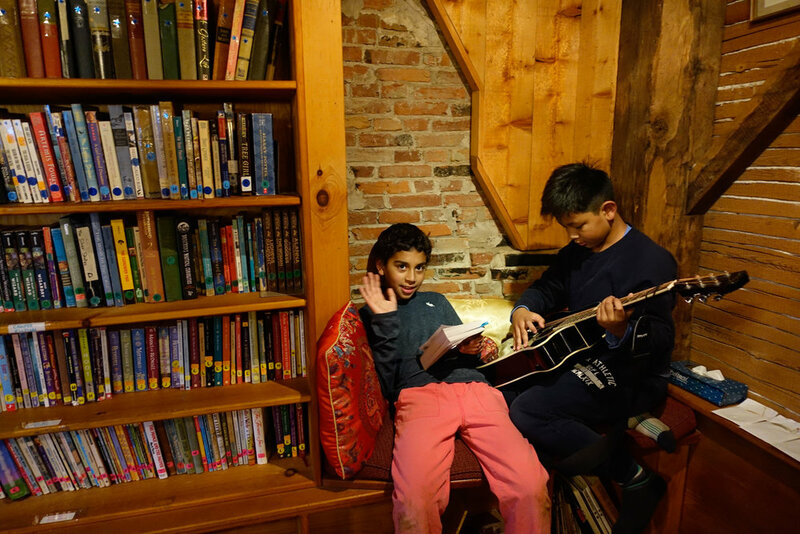 And in between all of that, there's opportunities to do all kinds of wonderful activities: learning about the farm and garden, working in the woodshop or on an art project, playing games with friends, exploring the flora and fauna of the forest, reading, drawing, writing, and so much more. We hope you enjoy this first batch of photos as a glimpse into the fun we've been having so far this week. Our apologies to those of you who are homesick for Camp, and to those of you who don't have a pond to swim in in this heat! You can see our first batch of photos here. Staff Training is over: welcome campers! Our staff this summer is truly incredible-- each person is kind, caring, and talented. We had an amazing staff training week coming together as a group, learning hard and soft skills of the job, taking care of the campus, and learning all about how Camp works. We are so excited for the arrival of the campers, and will post photos of our newly bustling community soon! For now, enjoy some photos from staff training. We had a tremendous week with the Waldorf School of Garden City's 8th grade class, and it's hard to believe the week is already over. 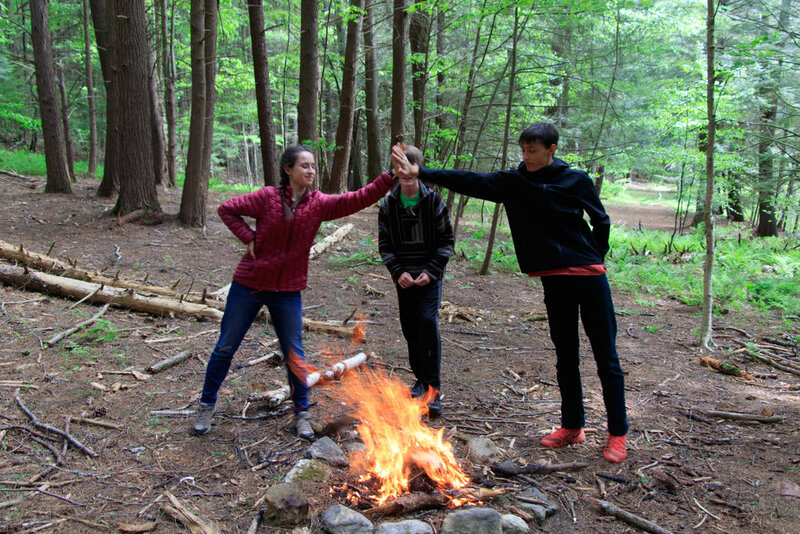 This new trip, the first of this class's two Glen Brook trips this year, is meant to strike a different tone: to explicitly acknowledge the fact that these students are stepping out of childhood and into adolescence, on their way to becoming more responsible and more independent in many ways. The students participated in many activities to strengthen their will force, and to help appreciate the work that goes into some of the systems they benefit from while here. 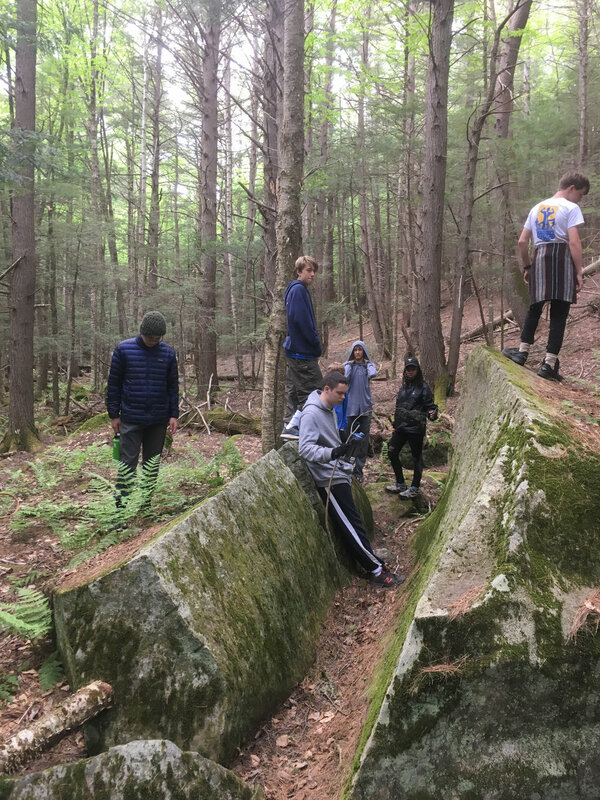 On our welcome hike the first day, we crossed over several bridges on the Glen Brook trails, each of which were built by previous class trips, and this week the students had a chance to rip out and rebuild the oldest bridge on the property. They had a chance to work on the farm to harvest, weed, and help feed and care for our pigs, chickens, and cattle. This week we served almost exclusively food grown and raised on our property, and they had a glimpse into the amount of work that takes. Everybody also got to split firewood, which will be heating the buildings and drying their clothes during their class trip in March. The students spent time in the evening in small groups having intentional discussions with adults about who they are, and who they want to be, they spent a lot of their free time at the lake, during this warm sunny week, and they had the chance to hike and play a game with the Monadnock Waldorf School's 8th grade, who they pen-palled and met with last year, and also made new friends with the Great Barrington Rudolph Steiner School's 7th grade, who was here for part of the week on their camping trip. Probably the most anticipated part of this trip was the solos. During their trip last fall, this class spent a few hours alone in the forest as a chance to be still, observe, and rest. This year, each student build a personal shelter, and stayed there for an entire afternoon, and through the night, while adults stayed out by a fire in the center of the spread out students. We were impressed and proud of how well they did, and no doubt they have stories to share of their pride, mosquitos, noisy owls, and how different the forest feels when the sun sets. Our Waldorf School of Garden City 4th grade class just finished their second annual Glen Brook Trip. They learned about animals in our forest, including how to learn from animals to find animals; they hiked Gap Mountain; they worked in the kitchen, garden, and yards of Glen Brook, and much more. We especially enjoyed this group's hard work and enthusiasm for chores, their love of singing, and their abundant curiosity. We know many of these students will be back for Winter and Summer Camp, and we look forward to seeing the class as a whole next year! Our Waldorf School of Garden City's 6th grade class was here for the week. A main focus of their time was astronomy: the students did observations of constellations with the naked eye, and of planets, stars, and galaxies with telescopes. We were grateful to have a chance to visit the Dublin School's Perkins Observatory to learn from their expertise and use their equipment. We visited and explored the many caves and tunnels at the local Bear Den natural area, practiced and learned fire building, and explored the Glen Brook woods. The students helped care for the farm and facility by raking leaves, pruning trees along our pasture edges, and moving firewood. It was a wonderful week, and we look forward to seeing these students and many of you at the Fall Fair tomorrow!